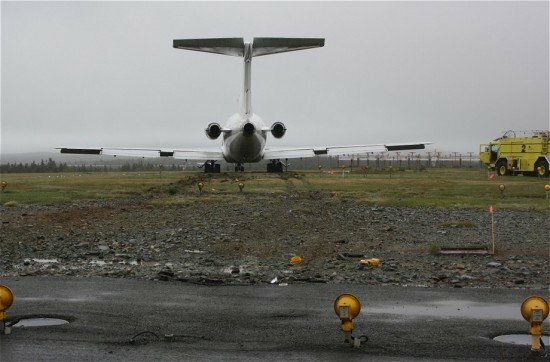 A runway overrun accident at at St. John’s International Airport, Canada in July 2011 highlighted the need to address runway overruns in Canada, an issue on the TSB Watchlist. On 16 July 2011 a Kelowna Flightcraft Air Charter Ltd. Boeing 727-281 departed Moncton International Airport for St. John’s International Airport on a scheduled cargo flight with 3 crew members on board. An instrument landing system approach was carried out and the aircraft touched down on runway 11. Following touchdown, the crew was unable to stop the aircraft before the end of the runway. The aircraft came to rest in the grass, with the nose wheel approximately 350 feet beyond the end of the pavement. There were no injuries and the aircraft had minor damage. At the time of the accident, the runway surface-condition reporting standards did not provide clear direction for rainy conditions or wet runways. The investigation found that some employees of the airline did not understand the obligations for reporting incidents under the safety management system (SMS). Although training was provided on SMS and reporting requirements, there was no specific guidance on what may be considered a reportable hazard. If all employees do not fully understand their reporting obligations, some safety issues go unreported, which increases the risk that those issues might not be identified and mitigated.